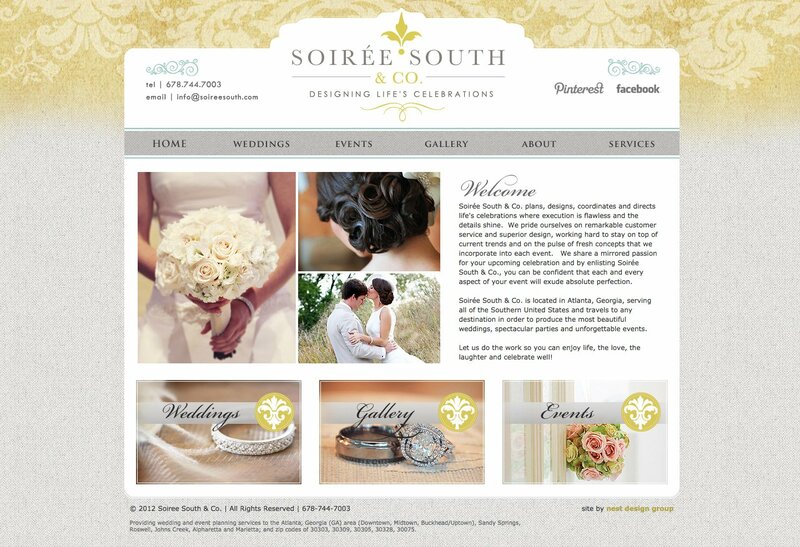 CLIENT: Soiree South & Co.
Soirée South & Co. plans, designs, coordinates and directs events and celebrations in the whole of the Southern United States. Their goal is to produce the most beautiful weddings, spectacular parties and unforgettable events. Laura, the lovely owner, approached me to redesign their website and make it more current, elegant, romantic, pretty, and clean. She wanted to keep their current logo and brand identity but recognized that their website was in dire need of a revamp. I asked her what she wanted site visitors to be able to do on the website, and this is what she said: “I want site visitors to really enjoy viewing pages and then clicking through each page. I want a great gallery that is easy for me to add photos to. I would like to add my blog on there so I can start blogging. I would like a contact page which I do not have, with good questions on it so I am getting info from potential clients right away. 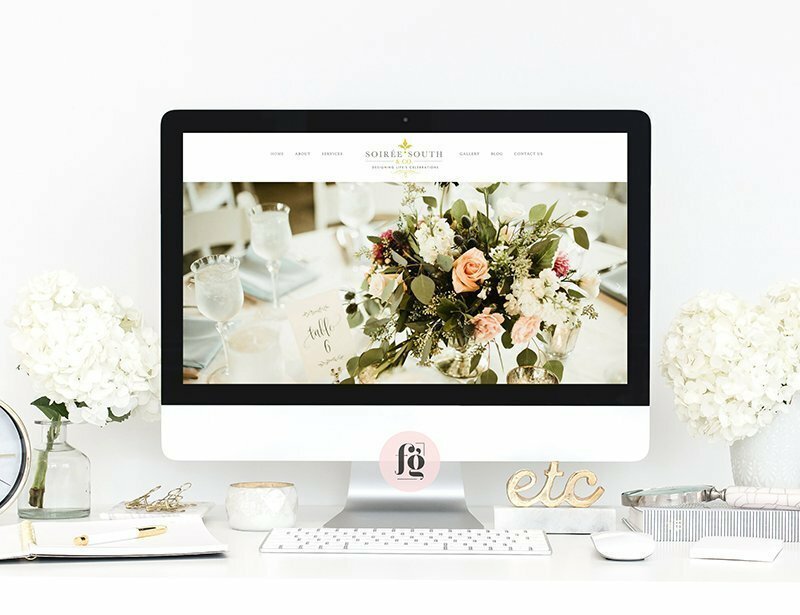 I would like the site to be pretty and make someone to want to keep moving through the tabs because it’s so pretty.” She also wanted the website to be warm and welcoming, and consistent with her brand identity. It was pretty, but it looked outdated, and wasn’t mobile-responsive. Plus, it was difficult for her to manage or update, because it was built in static HTML. Laura really wanted to be able to blog – all the more reason to for a major overhaul and shift to WordPress at the same time. The header is very simple and easy to navigate. It has her logo in the center, flanked by a split menu on either side. Subpages show up as dropdowns. It is followed by a slider of her favorite images (all carefully handpicked by Laura), and then a short welcome message with an image of one of her recent wedding clients. The background we used in this section is the same damask pattern in her old website – I just toned it down and made sure there was a lot of white space surrounding it. This is followed by her opt in form, and a grid of images that link to where she wants a site visitor to go. Her awards are displayed right below it. The same consistent style and elements are found in other pages as well. Oh, and did you notice how we picked a gorgeous script font for the titles, that I was itching to use for the longest time? I really love how it fit her style! The website also has an integrated blog now, which Laura has attempted to start. And most importantly, it is mobile responsive, and we made sure it looked gorgeous on all devices.